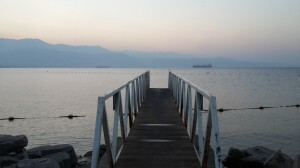 Recently I was in Eilat for a wonderful holiday. It was so special to take time out from my busy schedule and just be. Each morning I woke up at 6am to go for a walk. There was something magical about watching the sun rise over the mountains while reflecting off the water. The air was fresh and crisp. The city was still sleeping. There was no noise. Just beauty and the changing colours as sunrise arrived, and me alone with my thoughts. At this hour, where everything was still, I felt so much meaning in my life. This is why I love Logotherapy. It has helped me find meaning in all areas of my life and to rise above the struggles and the difficulties. I felt so grateful for the tools that I have and that I am privileged to be able to share them with people around me. I remember being filled with a gratefullness, which is really a GREAT FULLNESS, of how beautiful the world is, and no matter what we might be going through in our lives there is so much around us in nature that offers us an uplifting gift if we choose for it to be. I believe it is so important to replenish ourselves and fill ourselves up. We cannot give of ourselves to others if we are empty. For me, the place to start is in nature. I have spoken before about replenishing walks at the seafront or taking time out to meditate or read. These things are essential. You not only deserve them, you owe them to yourself. You can’t give of yourself if you are depleted. You can’t pour from an empty pot. It’s time to fill yourself up! Something else that I have been contemplating is being in the present moment. 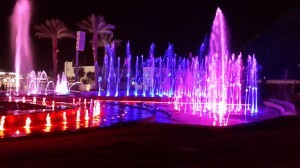 I went with my family to see the magical water show in Eilat. Here the water dances in changing colours to the music of Tchaikovsky, Mamma Mia and even Star Wars. I was so excited throughout the show and was snapping away on my cellphone as each sequence was more lovely than the previous one. I was also filming it to watch again, and to show others who were not with me. Before I knew it, the show was over and I felt cheated that I hadn’t fully experienced the performance. I had been too busy videoing and photographing and had really missed the show. I hadn’t been present. I was consumed with thoughts about which photos will go into my yearly album and which photos will be uploaded to Facebook, and just like that….it ended. Luckily I found out that there was a repeat performance 45 minutes later. I was so excited to have a second chance to experience the show. This time, I sat myself down on the grass in the middle. I put my cellphone away in my bag, I took a deep breathe in and felt the ground beneath me, and watched with the excitement and anticipation of a small child. I was in my element. I hummed along to the familiar tunes as I swayed from side to side and was very aware that my smile went from ear to ear. The experience washed over me. I was totally immersed. This was a different experience to the first viewing. It felt like I was part of my life, living it, not capturing it. Afterwards I felt so blessed to have had the second chance to just be present and savour each moment. I thought about the past year and wondered how many experiences and days I had not been fully present in. This is something I will take with me into the new year. Multi tasking is out. Being fully present is in! Appreciating each moment for the unique blessing that it is, is a gift I want to give myself. The gift that I received at the water fountains. I hope this blog has inspired you to take a look at the daily things that you do that you could maybe do with more magic, taking the time to savour them and be more fully present. As we all step into 2016, lets create our own second chances. I want to thank you for your support, encouragement and enthusiasm over the years. It is truly a privilege and a blessing for me to share these ideas and walk together with you on a meaningful path.